9to5Mac reports that Apple will be releasing an updated version of its Apple Store app for iOS devices on Tuesday, bringing a minor redesign and new tie-ins with iTunes Store, App Store, and iBookstore content. Through the updated app, Apple will offer special deals, making paid content free of charge for users of the app. As you can see in the photo of the upcoming app update (to the right), the app will promote content from the three Apple content stores. This content normally costs money, but will be available free for a limited time via this new app. Apple, internally, positions this as a way to boost content sales as this new feature is designed to raise awareness about Apps, iTunes, and iBooks content. The report indicates that the updated app will be part of Apple's effort to focus on iPhone sales in its retail stores, with customers being encouraged to install the app on their new iPhones, exposing to Apple's content offerings. In the example, shown in the screenshot, Apple is offering free downloads of Color Zen, a new puzzle game normally priced at $0.99. Apple's focus on iPhone sales is designed to boost the proportion of devices sold in its retail stores from the current level of 20%, although analysts have noted that Apple may have a difficult time achieving that goal given its network of just 250 stores in the United States compared to over 10,000 third-party sales locations such as carrier stores, Best Buy, and RadioShack. According to one U.S. study, 90% of first-time iPhone customers purchase their devices from somewhere other than an Apple retail store. The company has already begun taking some steps toward enhancing direct iPhone sales, including the device in its annual Back to School program for the first time. Under the program, eligible education customers can receive a $50 gift card good in any of Apple's content stores with the purchase of an iPhone. Apple is also partnering with recycling firm BrightStar to offer an iPhone trade-in program at its U.S. retail stores. That program will offer instant trade-in credit to customers, hopefully driving upgrade rates as customers will be able to immediately see the net cost of upgrading and take advantage of a simple means for turning in their used devices. You know it's real when the time is 9:41 A.M. 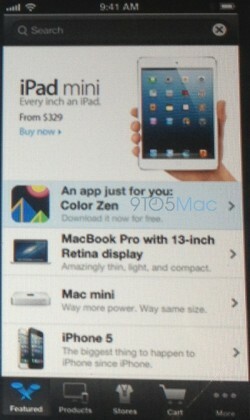 Anyone else notice in that screenshot they are advertising the Retina MacBook Pro and Mac Mini? Maybe updates are coming Tuesday also. You're living it wrong. Time to move. I have 2 Apple stores within 15 minutes of me. I still order online. Whats it matter to you, anyway? With all of those stores, and I assume some RatShacks, you have every Apple item you could need within 5 miles. Just not their "genius" bars. I guess iPad support is never going to come, then. i don't understand all the rants about apple stores. Especially the new mobile payment system is just great. EVERYONE can be your cashier. You don't have to wait in a line to pay something. You go to one of the blueshirts. Say "Hi i would like to have", he says ok, brings the thing for you and you can pay. On the other side ... you would have to search for the item, take it, wait in line to checkout and need longer. i would like to have a similar shopping system everywhere. The only thing that you could say against is "ieeeh i have to talk to a human"
Bought my macbook pro at the 5th ave store in manhattan in the middle of the day on a thursday. Had no problems, suffered no annoyances and yes it was crowded as hell. People just like to complain everything has to be done for them it's not possible to approach a blue shirt tell him ur in a hurry and u need x. Rarely is there a time when there isn't a free blue shirt u just gotta take the initiative and approach them if you want it done quickly, much like everything else in life I might add.